There is a definite trend with jerseys this season; take the third kit to the absolute next level! We have been treated to some incredible designs over the past few months, as brands look to create a connection between fans and the club they represent. It is always nice to have the latest jersey, but when there is history or some type of significance behind the design, it makes it just a little more special. Here, we take a look at some of the best designs, with a brief intro to how the brand came up with each individual look. Let us know in the comments which jersey you think looks better than the rest. 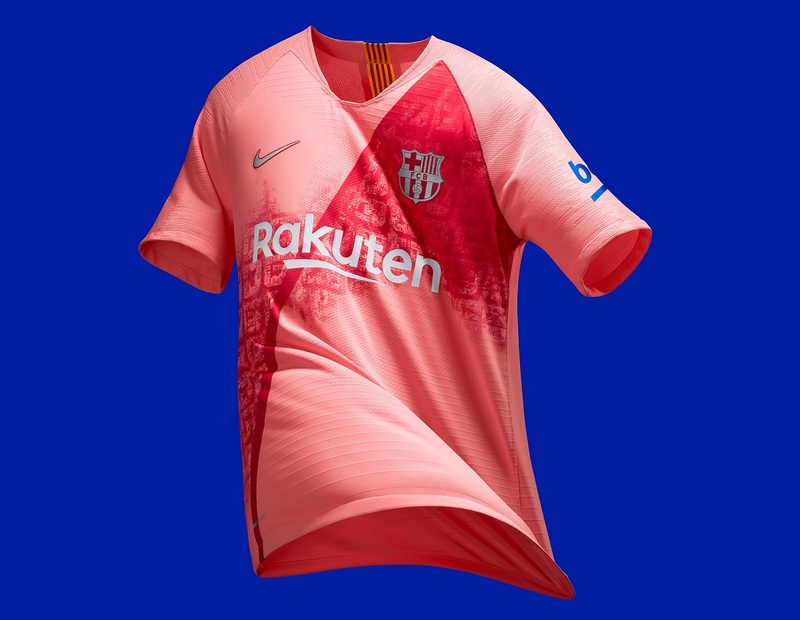 Just as the Avinguda Diagonal cuts an angular swathe through Barcelona’s city blocks, a sash darts from the left shoulder to right hem of FC Barcelona’s vibrant 2018-19 third kit, which completes a set of new kits rich in club DNA. 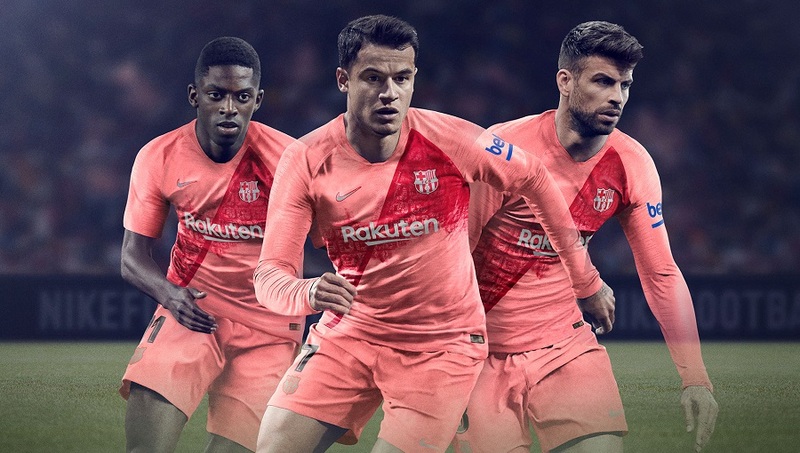 The two-tone shirt, with the darker red of the sash and its surrounding graphic gradually giving way to a paler pink shade, is the latest in a long line of daring changed kits worn by Barca. The new third kit for FC Internazionale Milano features a distorted map of Milan’s city center within a swirling marbled graphic. The pattern surrounds a thick, dark gray cross, which is a reference to the Cross of St. George, a powerful Milanese symbol found on the city’s coat of arms. 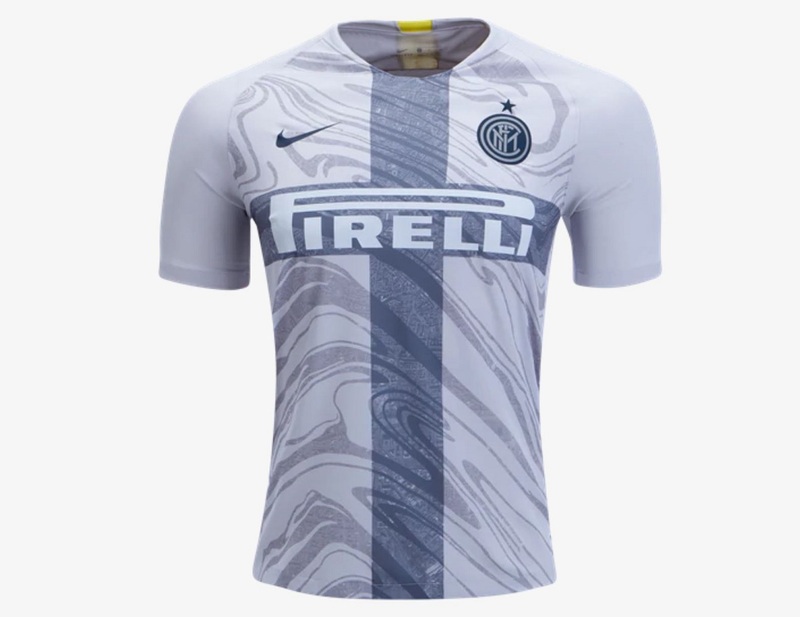 For a final flourish, the famous blue of Inter’s home shirt makes an appearance in the form of a blue Swoosh and club crest. 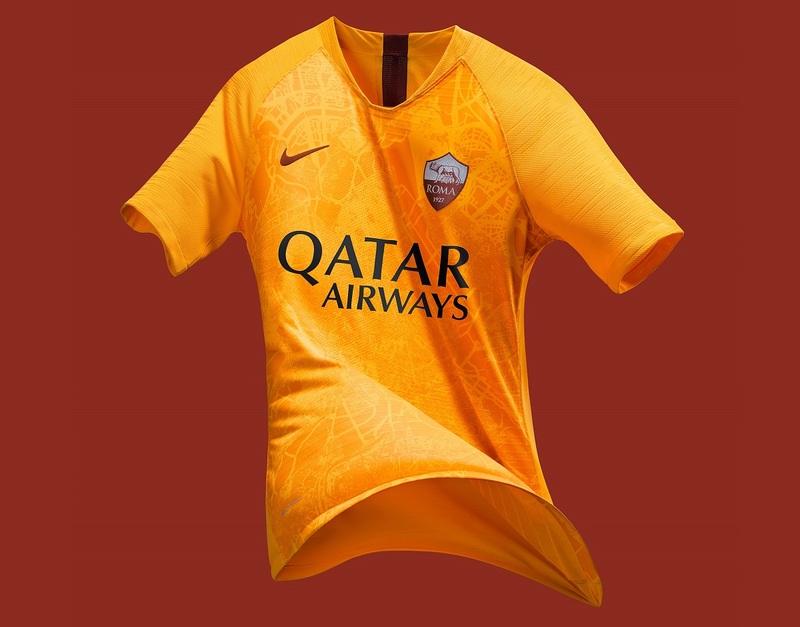 A series of aerial map views of key moments in Roman history form a distinctive pattern for the fiery gold jersey. Discreetly embedded within the design is the Lupetto, the she-wolf described in the founding myth of Rome, a powerful club symbol for the Giallorossi. Both the distorted map and the icon celebrate the city’s formidable history and potent future. 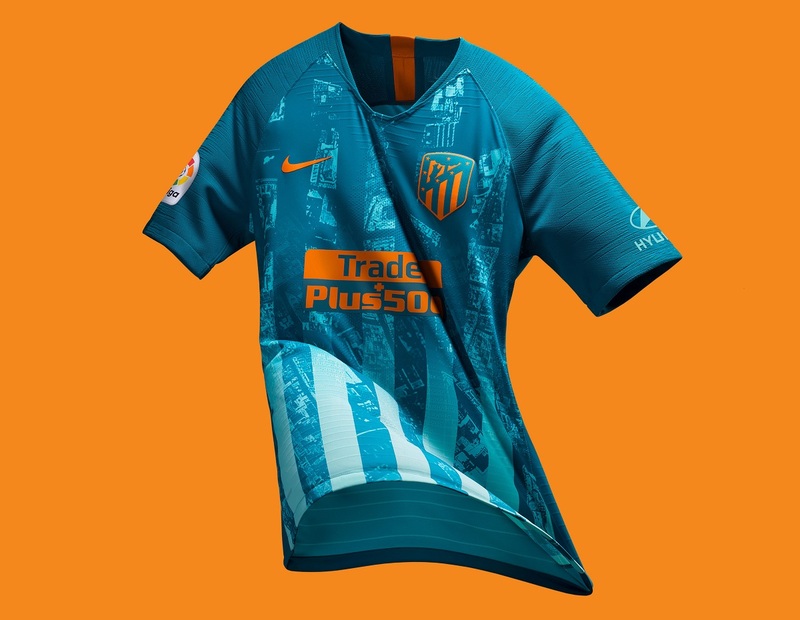 The Fountain of Neptune provided the creative spark for the color palette of Atlético de Madrid’s 2018-19 third kit. The striking two-tone blue shirt pays a twofold tribute to the synergy among the club, its supporters and the Spanish capital: First, by representing the water that flows from the fountain, around which fans gather to celebrate victories. And second, through its orange detailing, reminiscent of the way the city’s sunshine bounces off Neptune’s trident. 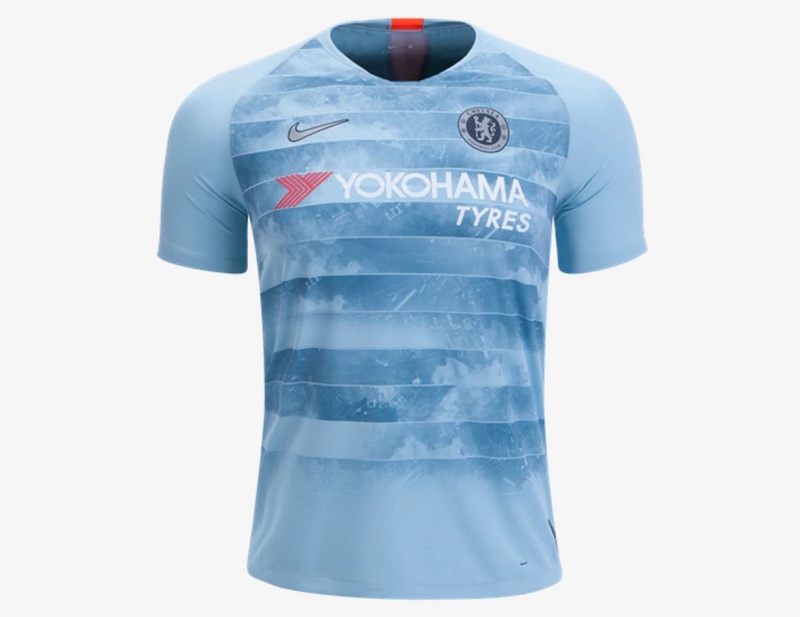 Inspired by the heart of London, the DNA of Chelsea is threaded throughout their new third jersey. The dynamic textural print on the shirt’s center appears at first glance to be a contemporary pattern, but upon closer inspection transforms into an aerial depiction of Stamford Bridge and its surrounding area. The Blues’ historic home is honored within the print, creating a link to London even when the team is playing away. Matched with teal blue shorts and crimson socks, the new third kit will be worn during the club’s European campaign this season. 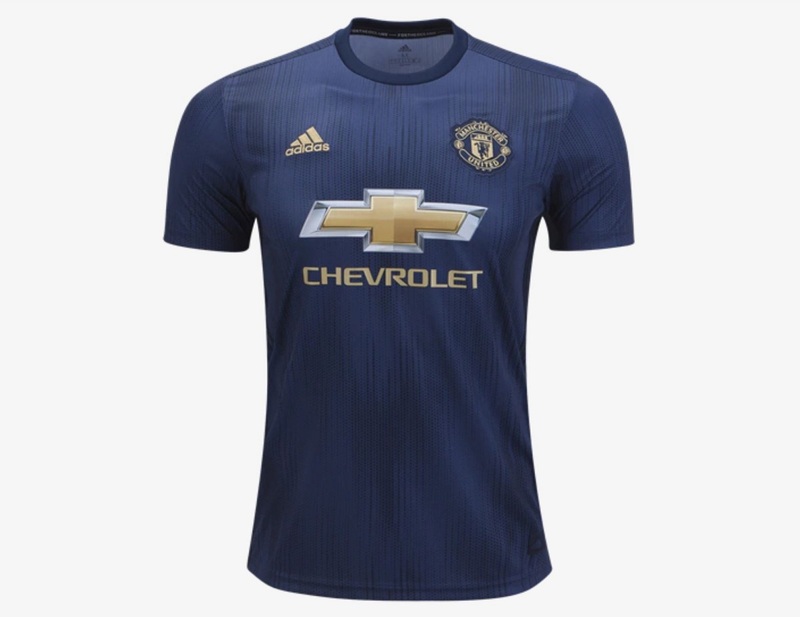 Made from a 100% recycled polyester interlock material that incorporates Parley Ocean Plastic, the innovative Manchester United 3rd kit fuses performance technology with eco-innovative design. The shirt is dark blue, inspired by the blue jersey worn by the 1968 European Cup winners, with gold accents. A blue and gold team badge is sewn on, with embroidered adidas logo. Blue adidas stripes run down the sides. “For The Oceans” is printed inside the collar. 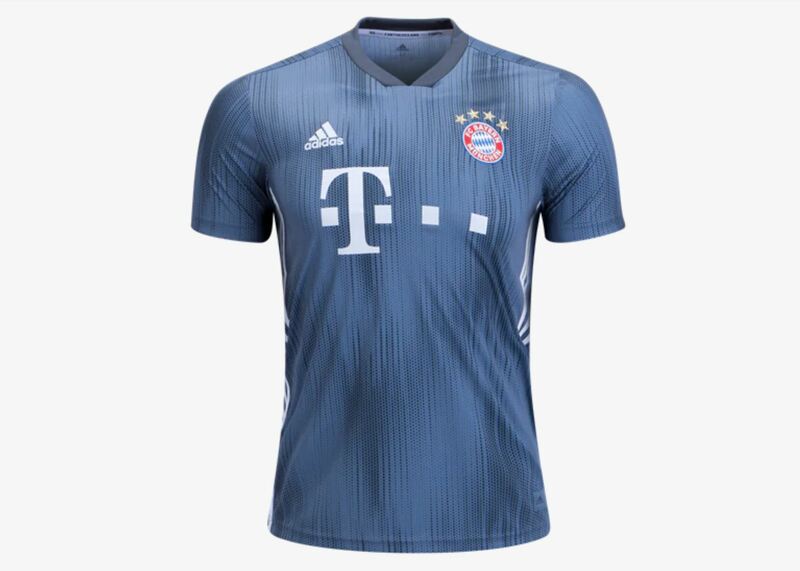 Made from a 100% recycled polyester interlock material that incorporates Parley Ocean Plastic, the innovative Bayern Munich 3rd kit fuses performance technology with eco-innovative design. A rarely used shade of bluish grey on the latest third shirt, only seen before on the team that reached the 1999 Champions League final. The Bavarians hope history repeats itself! White trim including adidas stripes and branding complete the contemporary design. Nike’s third jersey design is influenced by modern and unexpected color palettes found in urban environments and the natural world. The shirt’s print has a modern, asymmetrical pattern of dark colors and hard geometric lines. Upon closer inspection, the pattern reveals an aerial depiction of the North London club’s location in the Borough of Haringey (N17). 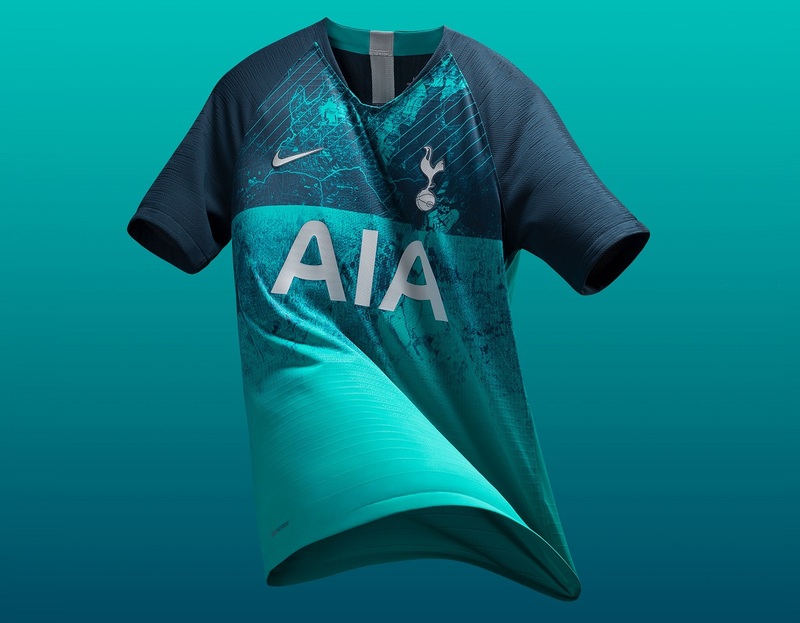 The green hue on the body, shorts and socks of the kit is inspired by the original logo of a brewery that owned a portion of the land where the Spurs’ new stadium is built. Tottenham will also wear the third kit in European competition. Keeping it simple with a design created for champions! 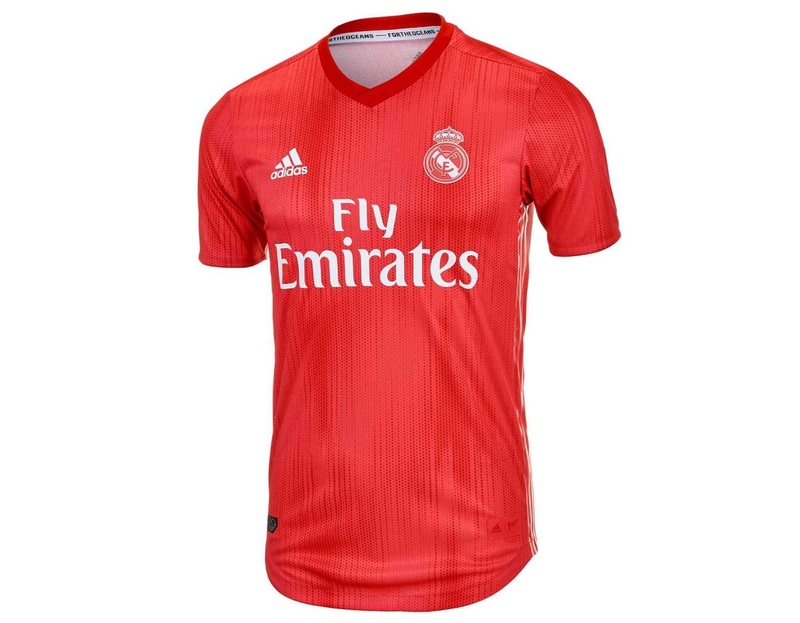 The new Real Madrid CF third kit is the first ever from Real Madrid to be mass-produced from Parley Ocean Plastic. Featuring a bold new coral colorway, the coloring represents various shades of coral; a homage to the beauty of the oceans that we need to protect.